Zack Greinke on Sunday. Credit: Matt Kartozian, USA TODAY Sports. Pitching leads to wins and losses. 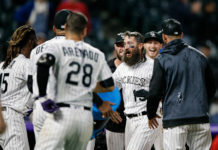 On Sunday, the Colorado Rockies hoped to sweep the Diamondbacks in Arizona, but sensational pitching from Zack Greinke and poor pitching by the Rockies’ men led to a 6-1 D-Backs win. In the first, Antonio Senzatela looked solid to start, getting a quick two outs, but then he gave up back-to-back doubles to A.J. Pollock and Steven Souza to give the Diamondbacks a 1-0 lead after one. In the bottom of the second inning, Arizona was threatening to score again before Nolan Arenado snared a line drive and turned a double play by tossing it over to first base with a quickness. 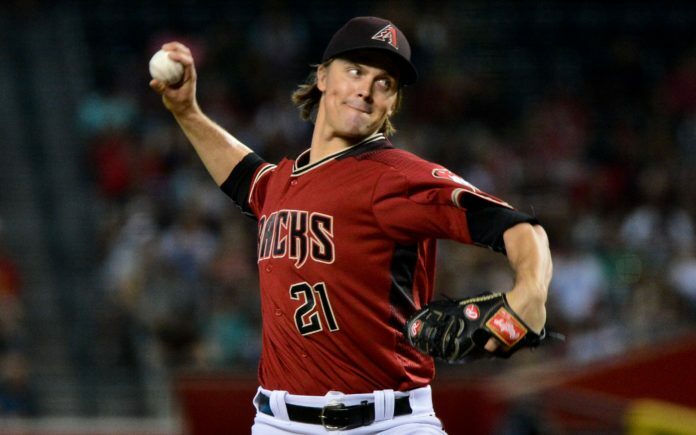 Meanwhile for the D-Backs, Zack Greinke started strong, retiring the first 13 batters without giving up a hit. With two outs in the fourth, Senzatela walked Jake Lamb, setting up a big rally for Arizona. Daniel Descalso singled and then “Senza’s” hanging slider was crushed on a line past a diving Gerardo Parra for a triple, scoring two. Through four innings, the Diamondbacks led 3-0. Finally, in the fifth inning, the Rockies got on the board with Ian Desmond’s home run to right field which barely got over the fence. 3-1, D-Backs, mid-5th. Greinke continued to be on fire in the sixth, running his strikeout total to 11 in that inning. In the bottom of the sixth, Arizona padded their lead; Chris Rusin walked one and another batter reached on a throwing error, and after loading the bases, was pulled. Yency Almonte entered, walked in a run and then allowed a single to Jeff Mathis to score two more and make the game 6-1 D-Backs. Grienke finished the game with 13 strikeouts, a second-best for him in his career. He went eight innings, giving up a mere two hits with the one earned run with one walk. Arizona went onto win in a game where pitching was pronounced by the Diamondbacks. For the Rockies, it snapped their season-high seven-game win streak. Colorado falls to 53-46, two games back of the Dodgers for first in the NL West. Colorado is now in third place with the D-Backs hopping back over them for second in the division. Next up: The Rockies are off on Monday before they host the Houston Astros for two games, have another day off and then host the Oakland Athletics for three games.